While watching a film about hikers in the high Sierras, I was reminded of the time I went camping there with the late, great Cryptozoologist Erik Beckjord (1939-2008), perhaps best-known for his "paranormal Bigfoot" theories. Beckjord claimed to know the very spot where Bigfoot "lived" and was most likely to be seen, and that is where we camped. I wrote the story of this little adventure in my Psychic Vibrations column in The Skeptical Inquirer, November/December, 1999. It is reprinted below. Some people might object that a posting about Bigfoot is out of place on a Blog called "Bad UFOs." I disagree. Bigfoot and UFOs have been linked together so many times that they seem to go together, like love and marriage, or a horse and carriage. (See, for example, the wild talk about Bigfoot and ETs given by Kewaunee Lapseritis at the 2014 International UFO Congress). 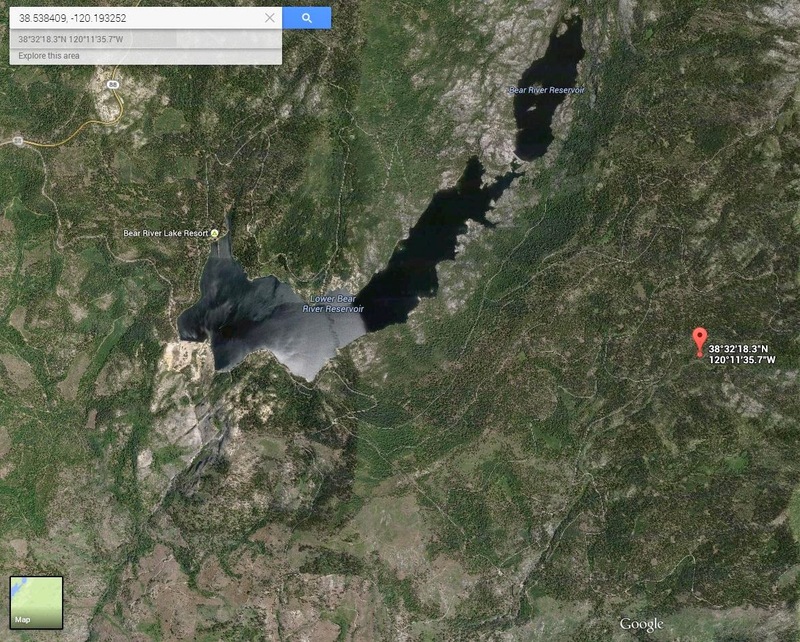 Beckjord never publicly revealed the location of his Bigfoot site, to protect Bigfoot from "evil people." Get your GPS ready, I'm going to show you where it is. Over a period of more than twenty years, veteran Bigfoot chaser Erik Beckjord of the Sasquatch Research Project has camped with other researchers at a remote spot in California’s Sierra Nevada mountains between Yosemite National Park and Lake Tahoe, at an altitude of 6,400 feet. He describes it as a “window site” where, he says, evidence of Bigfoot is almost routinely seen. “At this site we have obtained photos of weird aliens, bigfoot, gargoyles, etc that we never saw when we clicked the camera. We hear bigfootsteps. FIND BF tracks. Hear roars, wails, screams, some as close as fifty ft. Hear heavy breathing outside tents. Have strange shape-shifting ‘humans’ come by camp,” he claims on his website . Beckjord, who operated the short-lived UFO Museum in San Francisco, has been proclaiming for years that all skeptics were too timid and closed-minded to actually go out into the woods and confront the Bigfoot evidence for themselves. Because I got tired of hearing this, and because I hadn’t been out camping for a while, I agreed to join the search. “Bring your lady friend,” Beckjord urged me. “Bigfoot loves women!” She unfortunately was not able to join us, but she was kind enough to loan me her Jeep. When the time came to depart, Beckjord was hours late for our initial rendezvous. Indeed, all his planning for the big Bigfoot expedition seemed at best haphazard. Driving up to the mountains, we had to make frequent stops for him to purchase items he didn’t bother to get in advance. By the time we finally reached the entrance of the Bear River Reservoir area of the El Dorado National Forest, darkness had overtaken us. Beckjord - who claimed to have been to the Bigfoot “Window Area” so many times he could find it in his sleep - led us around dusty, unpaved Forest Service roads for an hour and a half before reaching a dead-end and admitting that we had made some wrong turns. We camped the first night right where we found ourselves. The sky was clear and dark, the Milky Way spectacular. We saw an extremely brilliant reflection from an Iridium satellite that looked as bright as a magnesium flare, appearing much more spectacular than any I’d seen before because of the very dark skies. Beckjord says that he had observed an event like this while researching Crop Circles in England in 1997 but considered it a UFO. Before we retired, he loudly played a tape of a human infant crying (which sounds eerie in the wilderness! ), claiming that is sometimes successful in attracting Bigfoot. He then set up two “Bigfoot detectors”, infrared sensors that beep if the signature of a person or a large animal is seen. The detectors were silent until he went out to turn them off the next morning. With the help of daylight, we easily located Bigfoot’s paranormal “Window Site” (Beckjord doesn’t want me to disclose the exact location, lest “evil people” go there and cause unspecified harm). Finding the road leading into the site in even worse shape this year than before, it would obviously be accessible only by four-wheel drive vehicles, which seemed to rule out taking in Beckjord’s 1978 Ford station wagon. While we are studying the obstacles between our vehicles and the site, we meet a friendly fellow with a four-wheel drive truck, who offered to carry Beckjord’s equipment past the impassable stretch of road. Afterward, Beckjord speculated in his email Bigfoot newsletter that perhaps the helpful stranger was not at all what he appeared to be: “Sort of a Good Samaritan MIB but in jeans. Now, was he CIA, MIB, MIJeans, a shapeshifter, or a tulpa, complete with truck?” Apparently, these days shapeshifters have the capability to take on not only animate forms, but become motor vehicles as well. We set up camp right at the shore of Bigfoot’s pond, bypassing a more comfortable camping site a hundred yards away at the other pond because Bigfoot allegedly doesn’t show up at that one. Unfortunately, Bigfoot seems to have chosen to make his home in a low-lying area with nearby brackish water, probably one of the most heavily mosquitoed areas of the forest. This suggests the possibility that Bigfoot, if he exists, may be a lower form of life. We looked all around the site, but didn’t see or hear much except flies and mosquitoes. Even animal life is sparse around there because there is so little food in the high-altitude forest. Later, Beckjord decided not to allow the road obstacles to deter him from bringing his old station wagon to the site. He nearly made it over road holes, rocks, and streams until his car was solidly captured by a huge mudhole. I towed it out with the Jeep. Beckjord had arranged with a group of psychics to help us see Bigfoot by projecting their powers toward us one evening at 9:30 PM. We were instructed look for flashes of light on the horizon. The time came and went, but nothing happened. Much of the supposed “Bigfoot evidence” at this site is photographic in nature. That is, even if you go there and don’t see anything, faint images of Bigfoot or other anomalous creatures allegedly turn up in the grain of photos you take. In previous years, a supposed Bigfoot had been glimpsed in photos, preferring to lurk under certain trees. I strolled around the pond to examine carefully the area under the Bigfoot trees. Alas, no evidence of anomalous apes was to be seen. We then climbed to the top of the ridge on the other side, where in previous years footprints and other “evidence” of Bigfoot activity had been seen. Alas, the proof still eluded us. During the whole four days I spent in the Bigfoot “window area,” nothing, alas, out of the ordinary was seen, heard, felt, detected, or smelled. This is not surprising: the presence of skeptics is known to have a serious dampening effect upon all manifestations of things paranormal. Another factor hindering Bigfoot activity was that fact that there was no woman in the party, at least during the time I was there. If we saw anything at all even a little bit unusual, it might have been several rocks that, by a stretch of the imagination (a big stretch), look like Bigfoot faces or skulls, when the viewing angle and the illumination was just right. Beckjord attributes this to shape-shifting tulpas that temporary inhabit the rocks and alter their appearance, in an attempt to communicate; I attribute it to the workings of an overzealous imagination. 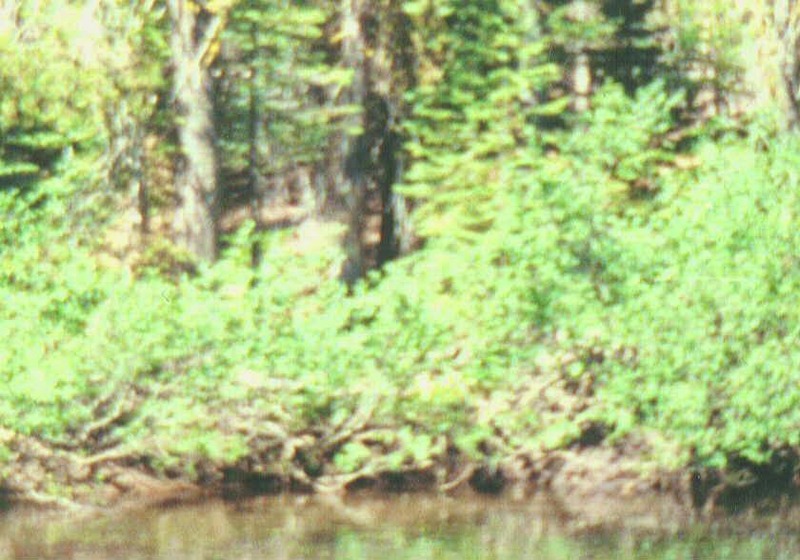 Beckjord’s website now announces the return, “flushed with victory,” of “The Great Sierra Bigfoot Expedition 1999.” It proudly displays the photo of the shape of “Bigfoot” straddling a split tree trunk. He also announced the “preliminary finding” that the “half-Bigfoot” allegedly photographed at the site in 1978 (apparently its lower half never materialized) “was found to have been bridging a ten foot gap between two trees, resting on a dead 2 inch branch!” The significance of this finding is not explained. Gumby-face, in center of photo. BF not seen at the time, photo by Erik Beckjord. It is possible that this is of a spiritual Bigfoot being, rather than a flesh and blood model. " As for me, I will do my best to contain my disappointment at not seeing anything paranormal. Maybe the best way to do so would be to get a T-shirt made up: I went on the Great Sierra Bigfoot Expedition of 1999, and all I found were mosquitoes. One skeptic, Robert Sheaffer, of CSICOP, did, to his his credit, spend five days there, but, as predicted, no activity was experienced, perhaps to due to the mind-set of skeptics, as broadcast mentally by the human brain. However, on that trip, 1999, a family group replaced Sheaffer onsite, and one of the children claims to have made a sighting of a Bigfoot type creature on top of a cliff, on the other side of a creek. Also, once the skeptic left, some photos were taken that produced a very tall humanoid image of marginal quality. Skepticism repels Bigfoot every time! Beckjord mounted yet another 'expedition' to the site in 2004, in which he claims to have recorded more "paranormal" images of Bigfoot in the trees. 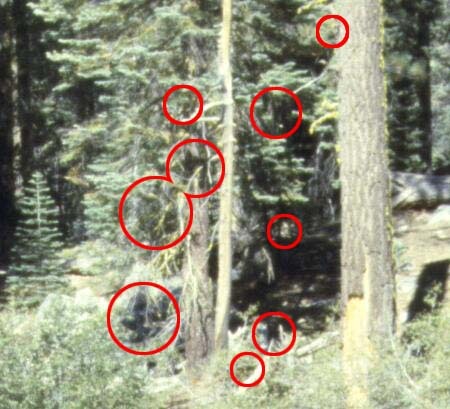 Beckjord claimed to have captured nine paranormal creatures in this photograph. Can you see them? I can't. On July 22, 2008, Jon Erik Beckjord succumbed to cancer. He was sixty-nine. He was a "larger than life" figure, in a way that is difficult to explain if you didn't know him. He was the closest thing Cryptozoology has ever had to a Hunter S. Thompson. Physically imposing (some suggested that he was Bigfoot), there was his celebrated fistfight with the late conspiracy theorist Bill Cooper (and no, I don't know how it started, or who won). He was arrested and jailed at least once. There was the matter of the money he persuaded a rich girlfriend to give him to make a Bigfoot movie (but there never was a movie). His devotion to Bigfoot and the paranormal was nothing less than an obsession that drove his life. Yet he did not, so far as I'm aware, make stuff up. He could back up every claim he made with "proof," even if his "proof" was ridiculous. It will do no harm if I now reveal the “secret Bigfoot site” to be at 38.538409 deg latitude, -120.193252 longitude. This is within the Bear River reservoir area of the El Dorado National Forest in northern California. The elevation is 6294 ft. The current photo on Google maps (presumably taken in the midst of the current California drought) looks much drier than when we were there. The campsite was at the edge of a shallow pond, but that area now looks dry.